The Nairobi Field Station (Nairobi FS) has an office in a rented apartment in Nairobi, and has used it as a research base since June 2003, covering both Kenya and Uganda. It is operated in cooperation with the Institute of African Studies of the University of Nairobi (Kenya) and Faculty of Social Sciences of Makerere University (Uganda). In FY2004, one faculty member and four graduate students of the Kyoto University Graduate School of Asian and African Area Studies (ASAFAS) were dispatched under the 21st Century COE Program, and they conducted education and/or research using the Nairobi FS. In addition, two ASAFAS faculty members, whose trips were financed by non-COE programs, carried out management and operation of the Nairobi FS. Further, one ASAFAS graduate student, whose trip was financed by a non-COE program, utilized the Nairobi FS. In addition to the faculty members and graduate students of Kyoto University, the Nairobi FS is also utilized by faculty members and graduate students of Hirosaki University, Okayama University, Tsukuba University, and others. 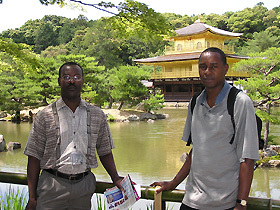 Dr. Isaac Nyamongo, Director of the Institute of African Studies, University of Nairobi; Mr. Mutua Charles Musyoki, ASAFAS graduate student, at Kinkakuji Temple, Kyoto (May 2004). 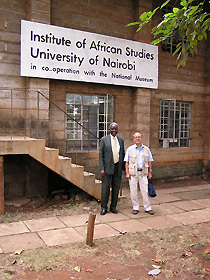 Professor Simiyu Wandibba, former Director of the Institute of African Studies, University of Nairobi and Professor SATO Shun of Tsukuba University (August 2004). OHTA Itaru (ASAFAS faculty member) visited Kenya from July 28 to September 4, 2004 under the 21st Century COE Program and engaged in such activities as development of the Field Station, on-site education for Mutua Charles Musyoki (graduate student enrolled as a third year student in FY2004) and joint research with the University of Nairobi. He also conducted fieldwork for his "Study on Social Changes in East African Pastoral Communities." KAJI Shigeki (ASAFAS faculty member) visited Kenya and Uganda from January 29 to March 6, 2005, with subsidies from Grant-in-Aid for Scientific Research. He provided on-site education to NAITO Naoki (ASAFAS graduate student, enrolled in FY1998) in Kenya and to SATO Yasuaki (ASAFAS graduate student, enrolled in FY2001) in Uganda, while undertaking field research for "An Investigation of the Multi-language Situation in Uganda and Descriptive and Comparative Linguistics Study of the Acholi, Tooro, and Nyoro Languages Spoken in Western Uganda." OHTA Itaru visited Kenya from March 12 - 28, 2005 with subsidies from Grant-in-Aid for Scientific Research, and conducted on-site education for NAITO Naoki and SHOJI Wataru (ASAFAS graduate student, enrolled in FY2004). Mutua Charles Musyoki; July 25 - August 24, 2004; private financing; Kenya; "A Study on Wildlife Protection and Conflict with Community Livelihoods in Kenya"
Mutua Charles Musyoki; October 18, 2004 - January 17, 2005; 21st Century COE Program; Kenya; "A Study on Wildlife Protection and Conflict with Community Livelihoods in Kenya"
NAITO Naoki; November 1, 2004 - March 31, 2005; 21st Century COE Program; Kenya; "Anthropological Study on Livelihood Changes and the Dynamics of Ethnic Relationships in African Pastoral Communities"
SATO Yasuaki; November 5, 2004 – March 28, 2005; 21st Century COE Program; Ethiopia and Uganda; "Anthropological Study on ‘Root Vegetable Culture’ in Northeastern and Eastern Africa"
HAZAMA Itsuhiro (enrolled in FY2003, ASAFAS research fellow) January 5 - March 23, 2005; 21st Century COE Program; Uganda; "Anthropological Study on Livestock Recognition in a Pastoral Community in Northeastern Uganda"
SHOJI Wataru; March 1 - July 5, 2005; private financing; Kenya; "Anthropological Study on Plant Use by the Turkana Pastoral People of Northwestern Kenya"
The operation of the Nairobi FS requires a young resident researcher, but this is financially difficult. As such, faculty members and graduate students who use the FS are involved in its operation, taking on all kinds of chores such as the maintenance of office equipment and payment of utility charges. In Nairobi, there are frequent failures, involving telephones, electricity, water, cars and locks, and to cope with this, considerable labor is needed. In FY2005, the 21st Century COE Program is planning to employ young researchers to be assigned to manage and operate FSs, assist the education and research and promote joint researches with the University of Nairobi, Makerere University, Addis Ababa University (Ethiopia) and Sokoine University of Agriculture (Tanzania). The education and research activities of the Nairobi FS are implemented in close cooperation with the Institute of African Studies, University of Nairobi. From May 25 to June 7, 2004, Dr. Isaac Nyamongo, Director of the Institute, was invited to Japan, for a review of the Memorandum of Understanding (MOU) concluded between the Institute and the Center for African Area Studies, Kyoto University, ending in the conclusion of a new MOU with the Kyoto University Graduate School of Asian and African Area Studies, thus confirming the system of cooperation between the two institutions for the future. On June 5, Dr. Nyamongo gave a lecture entitled "Ecological Change and Malaria Risk in an Unstable Malaria Region (Gusii) of Southwest Kenya," which was followed by vigorous discussion. He also took part in the 41st Annual Meeting of the Japan Association for African Studies and deepened exchanges with Japanese Africanists. On August 2, 2004 at the Nairobi headquarters of Kenya Wildlife Service, OHTA Itaru met with Mr. Richard Bagine, deputy chief of the research and development department of the institution, and discussed the research of Mutua Charles Musyoki on "Wildlife Protection in Kenya and Conflicts with Community Livelihoods" and consulted about the future cooperation. OHTA is participating as a co-researcher in a joint research project, "Integrated Study of Livelihood Safety Nets in an East African Pastoral Zone and Interregional Links" (Project leader: SATO Shun, Tsukuba University) subsidized by Grant-in-Aid for Scientific Research, which was implemented as a joint research with the Institute of Ethiopian Studies of Addis Ababa University and the Institute of African Studies, University of Nairobi.